Craig Swain is a native of Missouri who now lives in Northern Virginia. 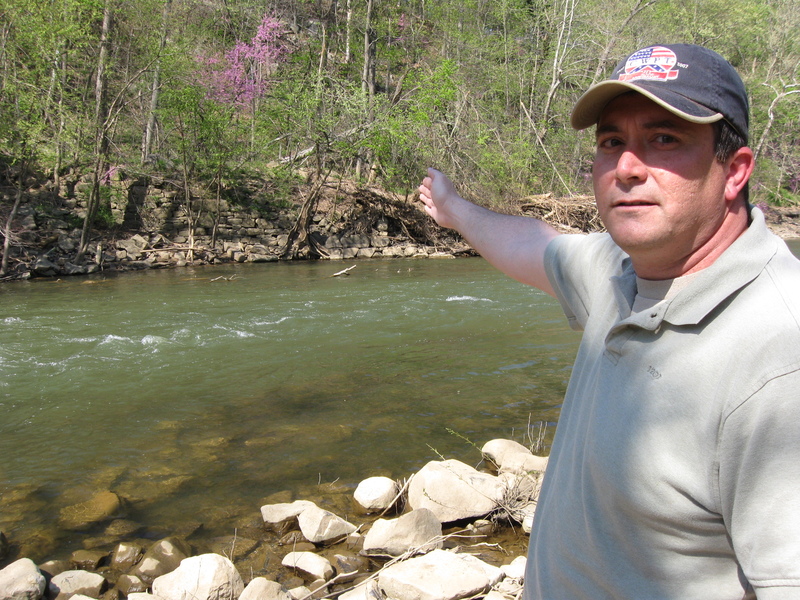 He is standing along Goose Creek near the site of Kephart’s Mill. This view was taken facing northeast at approximately 3:00 PM on Sunday, April 11, 2010. The United States’ Army of the Potomac crossed the Potomac River near Leesburg, Virginia, from June 25-27, 1863. Historian Craig Swain describes this movement of men, animals, equipment and supplies, from Virginia to Maryland during the Gettysburg Campaign. Craig Swain is originally from Southeast Missouri, and received a BA in History from Westminster College in Fulton, Missouri. After college he served as an officer in the Army for eight years, posted in Texas, Georgia, Korea, and the Middle East. After the Army, he returned to college and completed most of the work for a master’s degree in history. A career in information technology eventually landed him in Northern Virginia. Craig currently works as a consultant providing internal collaborative solutions for government organizations. Craig is the “Civil War category editor” at the Historical Marker Database (http://www.hmdb.org/), cataloging and documenting historical markers. He serves as a board member on the Loudoun County Civil War Roundtable and is also on the board of the Brandy Station Foundation. Craig also maintains a blog where he explores other Civil War topics, including interpretation of Civil War sites, battlefield preservation, tactics, and artillery: http://markerhunter.wordpress.com/. To contact Craig, please use the comments section at his markerhunter.wordpress.com website. He will respond promptly to your comments/questions there. In our first Edwards Ferry post, Craig Swain gave us an introduction to the Leesburg area, described why pontoon bridges were built at Edwards Ferry, and showed us the entrance to the best trail leading to the location of the pontoon bridges across the Potomac. In today’s post, Craig Swain takes us along Goose Creek, and shows us the location of one of the bridges across Goose Creek, the Goose Creek Canal and locks, and where he believes a pontoon bridge was constructed by the Army of the Potomac across Goose Creek. This map shows the location of the Edwards Ferry Videos. Video #s 1-3 were shown in our first Edwards Ferry post. 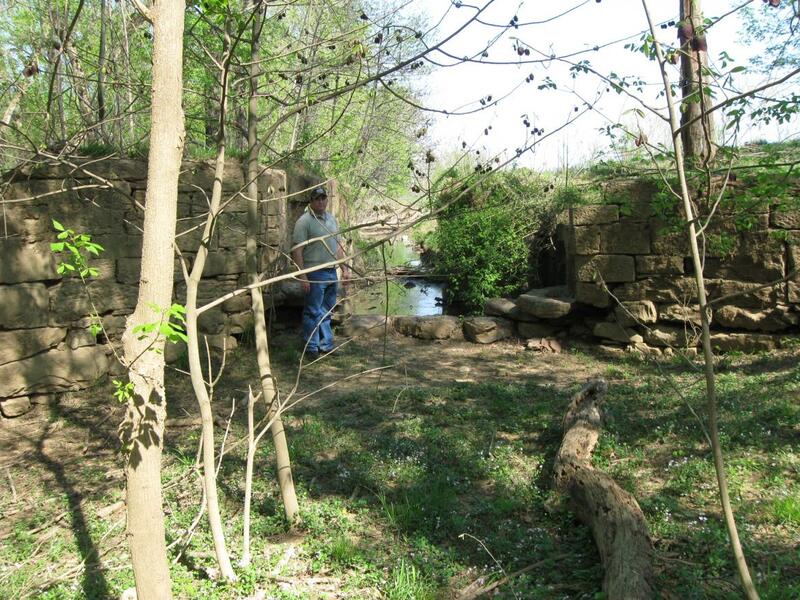 Videos #4-5 were taken along Goose Creek near the site of Kephart’s Mill. Video #6 was taken near one of the canal locks of the Goose Creek canal. This map was created facing north at approximately 3:00 PM on Sunday, April 18, 2010. Craig Swain is still standing along the remmants of the Goose Creek canal. 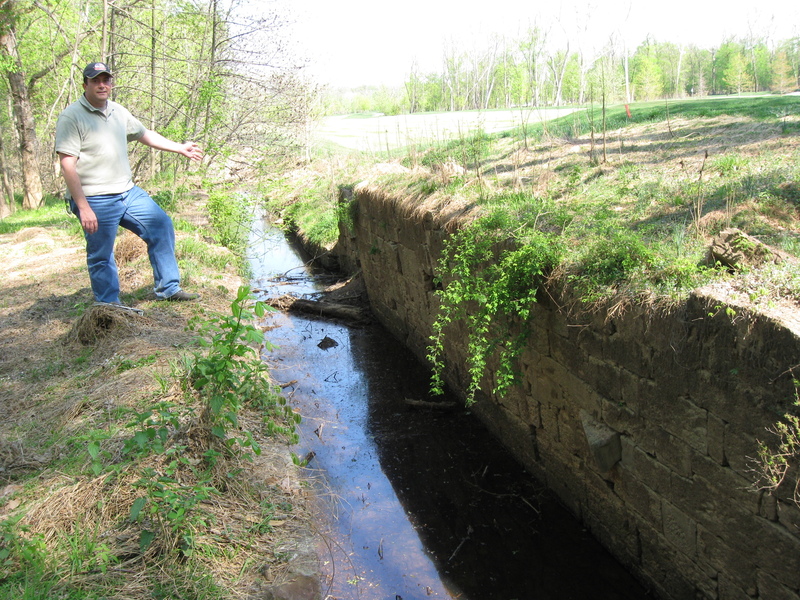 He is pointing to the large ditch where the water from the canal flowed. Construction on the canal began in 1849, and it was intended to connect Virginia’s Loudon Valley with the Chesapeake and Ohio Canal on the Potomac River. This view was taken facing east at approximately 3:00 PM on Sunday, April 11, 2010. 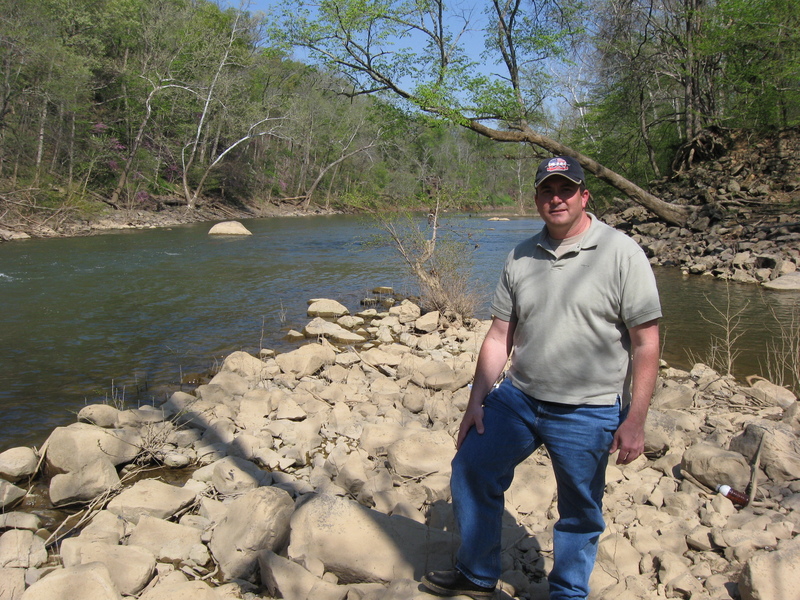 In Video #4 (Videos #1-#3 were shown in our previous Edwards Ferry post) Craig Swain is standing along Goose Creek. He shows the location of Kephart’s Mill and the Goose Creek Canal. This view was taken facing west to east to west at approximately 3:00 PM on Sunday, April 11, 2010. This map shows some of the important locations along Goose Creek including the Goose Creek Canal, the locks of the canal, and the California Road crossing Goose Creek. The red X shows that the bridge had been destroyed earlier in the war, so was not available in 1863. In yellow are the pontoon bridges of the Army of the Potomac constructed in June, 1863. One bridge crosses Goose Creek (Craig will show where he believes its location was in our last picture on this post), the two pontoon bridges crossing the Potomac River at Edwards Ferry, and the bridges crossing the Chesapeake and Ohio Canal on the east (Maryland) side of the Potomac River. In today’s post, we follow Goose Creek to the Potomac River. The map was provided by Craig Swain. 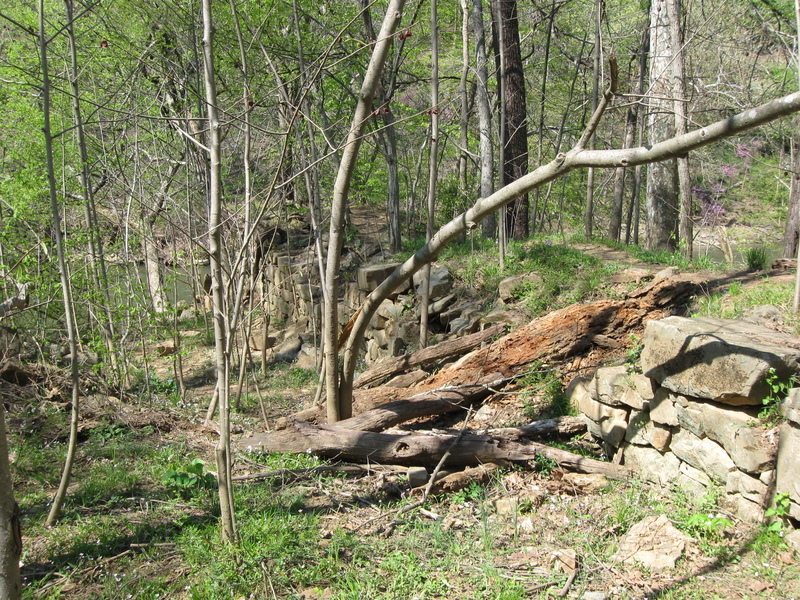 The rock foundation of the Kephart Mill Bridge which carried the California Road over Goose Creek. We are on the south side of Goose Creek. This view was taken facing north at approximately 3:00 PM on Sunday, April 11, 2010. Craig Swain is pointing to the rock foundation of the Kephart Bridge on the north side of Goose Creek. The bridge, which was burned by Confederates in 1862, carried the California Road over Goose Creek at this location– Red Rocks Ford. This view was taken facing north at approximately 3:00 PM on Sunday, April 11, 2010. In Video #5, Craig Swain explains that there were three bridges that crossed Goose Creek, and that we are standing at the Kephart’s Bridge. 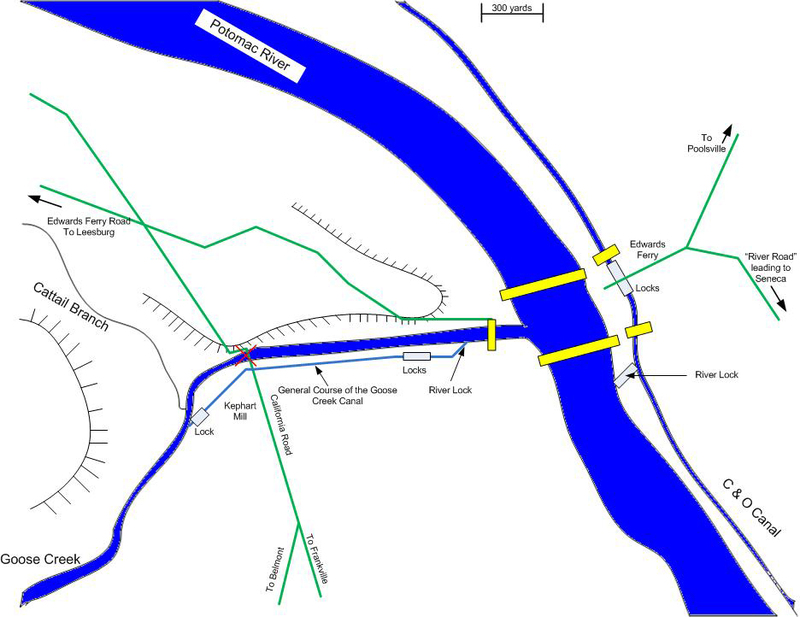 Because the bridges across Goose Creek were destroyed, the Army of the Potomac was separated by Goose Creek, and would need a bridge across the creek for better communication/transportation. This view was taken facing east at approximately 3:00 PM on Sunday, April 11, 2010. As we continue our walk along Goose Creek, Craig showed us a lock on the Goose Creek canal. This was one of nine locks along the Goose Creek canal. Only one canal boat actually traversed the whole length of the Goose Creek Canal, and that was in 1854. This view was taken facing east at approximately 3:00 PM on Sunday, April 11, 2010. Craig is now standing on top of the canal lock. Low water and the coming of the railroad led to the demise of the Goose Creek canal, and the canal company was dissolved in 1857. However, the waterway was used by some boat traffic until the early years of the 20th century. This view was taken facing east at approximately 3:00 PM on Sunday, April 11, 2010. In Video #6, Craig Swain is standing by the Goose Creek canal lock known as either Kephart Lock or Elizabeth Lock depending on the time period. The lock is a good fixed point to orient oneself to other locations in this area. This view was taken facing east at approximately 3:00 PM on Sunday, April 11, 2010. 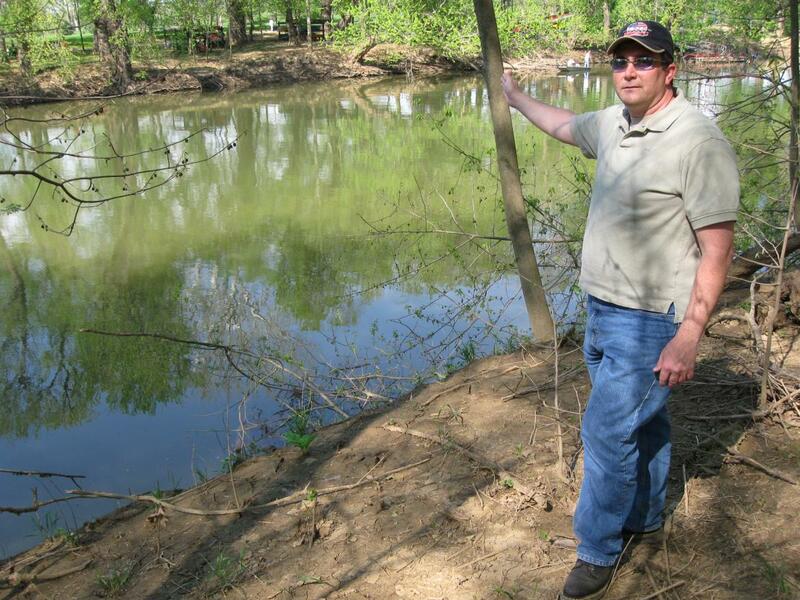 Craig Swain is standing on the south bank of Goose Creek. 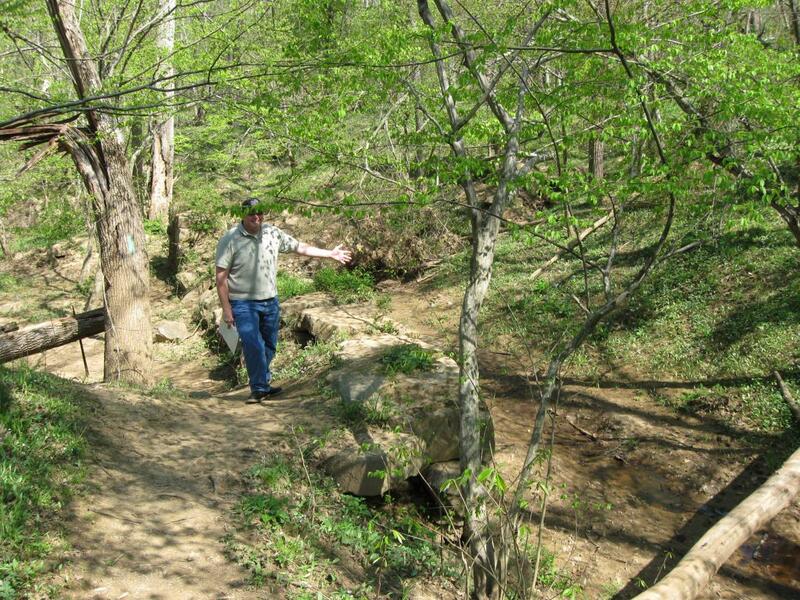 He is pointing to where believes a pontoon bridge was laid across Goose Creek by the Army of the Potomac. We are approximately two hundred yards from the Potomac River. Across the creek is a closed/gated community. To give you an idea where we are, in case you decide to walk this area yourself, the area where the members of the gated community launch their canoes is in the right background. This view was taken facing northeast at approximately 3:00 PM on Sunday, April 11, 2010.